They are very helpful, friendly, and very accommodating to the residents. We have two bedrooms, two baths, a living room, and a kitchen looking down at the beach. The food is excellent. The dining room is spacious and clean. It is very secure. They have security patrols and closed circuit cameras covering the entire property. They have 35 committees. They have bus trips, a fitness center, Pilates classes, water aerobics, meditation, stretching, balance, yoga, and entertainment. I'm happy with the way things are. I would definitely recommend White Sands La Jolla to others. White Sands La Jolla is the only place that provides exactly what I want: an independent place to live with assisted living when I need it. It's very convenient. I met with David who explained the place and was very helpful. They have everything, including a library, gym, places to walk, access to the beach, and so on. They have a choice of studios or apartments, and I'm going to have a one-bedroom apartment. They showed me everything they have in terms of activities. I visited White Sands La Jolla. It is a newer building. It is on the beach. It is luxurious. The price is pretty luxurious too. We're very impressed with White Sands La Jolla. It's really a fantastic location and a very nice place. Unfortunately, it's too expensive for my sister. It's over her budget. I saw a single room and you would have to provide your own furniture. The staff was very good and very knowledgeable. They were doing some renovations. Thank you for considering us, Marvin, as you and your sister continue to explore senior living options. You visited us at an opportune time, as we're just putting the finishing touches on a $20 million renovation to our west campus, including a variety of new amenities, dining areas and other common spaces. We're glad you found your tour informative. If you have any additional questions about our community, or would like to come back to experience something you may have missed, give us a call and we'll be happy to arrange it. My siblings and I recently moved my parents from the east coast and we couldn't be happier with this facility. My mother, who was very active, had a severe stroke and would need long term skilled nursing care. My father, who is semi-independent would need a facility where he could easily visit her and have meals and activities provided for him. We found both and more at White Sands and have less worry that their care needs would change and we would need to move them again and face more difficult decisions. The skilled nursing staff are extremely caring, attentive, friendly and I am told their staff turnover is very low. The location is beyond lovely being right on the beach and in beautiful La Jolla - it is rare to find a skilled nursing facility where you can enjoy fresh ocean breezes, beautiful views instead of recycled stale air. There is a limo that can drive independent residents to local doctor appointments and errands, which has been wonderful for my father who no longer drives. The facility is currently being remodeled and will be even more lovely when they are finished. The residents are very friendly and welcoming, the staff go out of their way to know you and provide wonderful service. Meals are fresh and healthy, and visiting family can all enjoy the main dining room together with both of our parents and a beautiful ocean view. Finding White Sands was a huge blessing to our family, knowing that our parents are well taken care of and that we were able to keep them together after a traumatic family event. I have been to the White Sands La Jolla. It was amazing. It was right on the Pacific Ocean, and the patio was right overlooking the Pacific, the little beach. The people were friendly, the apartments were lovely, and their meal plan was interesting because you get a certain amount of points, and so say you go back to visit your kids for a month, you can take these points and apply them to other meals. The activities that they have were very diverse from addressing mind, body, health, and nutrition activities for the residents. They have the memory care, so as my mom progresses from mild cognitive to moderate to severe dementia, she will not have to move because she will be able to move within White Sands instead of to a new property for memory care. But it was quite expensive. Of course, it was the most beautiful property we visited because it was literally right on the Pacific Ocean, so it was lovely. But you are paying for location, and at this point it is out of my mom’s price range, unfortunately. You can have all 3 meals if you want. We didn’t stay for food, but they were having a pasta bar that day, and we kind of wished we were staying for lunch. They had all kinds of pasta, it smelled so good, and it was like you put on your pasta what you want, and the chef stirs it up for you. The staff was very informative, willing to answer any questions, and nothing was off-base. They gave us a complete tour of all the facilities such as the exercise room, the pool, the deck, and the cafeteria, and they were building a bistro right now. They have Happy Hour, movie nights, dances, and all kinds of wonderful things. Their community spaces were large and spacious. It was a lovely property. White Sands La Jolla was upscale, very expensive, and right next to the ocean. The staff was very competent and very informative. They had all sorts of amenities right there. I don't think that there's anything they don't have from the little I know about the retirement community. Of course, that's reflective in the buy-in and the monthly fees. It's expensive. I wasn't able to judge the food, but the dining area seemed to be very nice and very upscale. We appreciate your visit and compliments, Bert, and I'm glad we were able to provide you some valuable information. We'd be happy to talk further about the value of living here, and all the services this includes. If we can offer any additional information on White Sands, or the benefits of community living, please don't hesitate to let me know. Perhaps you would like to join us for lunch here to get a taste of our cuisine. Gary Boriero, Executive Director, White Sands La Jolla. White Sands La Jolla is a very nice place. The rooms seemed very nice, comfortable-looking, and clean. The staff seemed nice, and I like their common areas downstairs. They had a swimming pool, a gym, and a main dining room that were under construction. Thank you for taking the time to leave your thoughts about our community, Hank. We’re pleased to hear you enjoyed your visit. As you mentioned, we’re undergoing a significant remodel of some of our amenities, including our lounge, library and a new bistro. When this work is completed, we hope you’ll give us a call for another tour. White Sands La Jolla was very nice. It was a little too expensive though. The building, the staff, and the lunch were nice. There are a lot of establishments. The rooms at White Sands were very nice. They were under construction, which made it a little difficult to see, but we got to see lots of the rooms that they were working on. It has a beautiful view of the ocean and almost every general/public rooms looked out unto the beach. It is a very beautiful place. We talked to a lady who was in charge of the events and bus trips. The people are very friendly. The visit at White Sands At La Jolla was fine. They have newer buildings for independent living, which looked fine. The assisted living and skilled nursing were in the renovated older building. The scenery was beautiful. The dining area was very nice, though the only concern I had was that there were some flies around while we were dining. The facility is right next to the ocean, so there's a great ocean view. It looked very nice and very comfortable. You can either get your own food at open bars or you can sit down and have somebody bring food to you, which was good. I only saw two residents doing exercises in the gym room. Thank you for visiting our community. In addition to the beautiful scenery we have residents who deeply care for one another as well as professional staff who dedicate their work life to helping all of our residents be who they want to be. Sorry about the pesky flies. There are times of the year they love the beach as much as we do, so we have professional services and measures in place to minimize them as much as possible. Many of our residents enjoy working out alone, while others use the services of our personal trainers during scheduled appointments. I hope you will come back and visit us again soon. White Sands La Jolla reminds of a five-star resort for independent living, but the assisted living did not have easy to access ocean views and felt a little remote. The dining rooms were very nice, but the rooms were just adequate. The independent dining room overlooked the oceans, but in order for the people from the assisted living to go there, it was a pretty long walk. I would love to live there, but I wouldn’t want to be in the assisted living because it is not as close. It is definitely a positive independent living community, but for assisted living, some of the amenities were not as easily accessible. The staff was very nice. They did have lots of events they go to outside the facility. Everything was clean and neat. They also had the amenities, like a nurse on duty and a clinic area downstairs. I like the exercise classes. We have an excellent 24-hour nurse. I had an injury while on a trip, and she treated me every day. They're in the process of trying to rehab an older building. It's a beautiful large place, and it's right on the beach. It was a hotel formerly. This is what they call a step down unit, so it has memory care and skilled nursing. The guy that took us around was rather indifferent. He just walked ahead of us. It was not as good a visit. I was not impressed with White Sands La Jolla, and there was a large upfront fee. There is only one place better than White Sands: Heaven!! Each day, I receive excellent service from the top administration to the staff at the front desk, maintenance, housekeeping, dining room, outside services (trips)...all that is done for me here at White Sands. The quality of work, assistance, time taken, and expertise is given with patience, a positive attitude, and love. I could not find a better, more friendly place anywhere else. My gratitude to all. God bless you. We live in paradise. It's not just a perfect location (on the beach) within walking to the Village of La Jolla, it is the people -- both residents and staff. We have FUN. So many interesting events and things to do. We love it. Our best decision. A beautiful ocean view location with a caring and attentive staff. There are lots of interesting trips and activities arranged by our extremely creative Activities Director -- theater, museums, symphonies, nature walks, etc. -- and an excellent transportation in-house. No car needed. The outings planned, advertised, and conducted are excellent - both in the variety and the content. Thank you for the support and interest of the staff. We have been residents of White Sands now for a year. Being located on the Pacific Coast, it is like living at a Mediterranean resort. The services provided are excellent, the food offerings have caused me to gain a few pounds, but no excuse as White Sands has exercise classes and a well-outfitted gym. In independent living, I receive house cleaning every two weeks and trash and recycle pick up. Emergency attention and limo service in an atmosphere of ocean front charm. Both assisted living and full health care available. Very pleased with quality of renovations to our unit before we moved in. The staff has been great in all ways possible -- helpful as can be. Plenty of day trips are available, and the ocean view is great. Food selection and quality has been appreciated and enjoyed. We've been quite pleased with our choice of White Sands. When my siblings and I searched for the best assisted living for our then 92 year old mother, our main priority was a residence that exuded warmth and security within a family-oriented environment. We found this, and more, at White Sands of La Jolla, situated 20 minutes north of San Diego, California. Now five years later we have not been disappointed. White Sands' staff has been exceptionally helpful every step of the way. The nurses and CNAs have tirelessly provided the best personalized care imaginable. With three of us living out of state, White Sands administration has adapted to our particular needs throughout our extended visits, promptly contacting us in the event of any unusual circumstance. The entire staff is incredibly friendly and efficient, to the point we are on a first-name basis with everyone, including the kitchen servers, maintenance, and all the caregivers. It has been tremendously comforting for us as a family knowing that Mom's needs are being met and she is being cared for with the utmost respect and dignity. I highly recommend White Sands of La Jolla. Waking up each morning and taking a morning stroll along the coastline before joining friends for a round of golf at the Torrey Pine Golf Course or an outing to the Museum of Contemporary Art. End the day dining alfresco as you watch the sun set over the Pacific Ocean. For the residents of White Sands La Jolla, they don’t have to imagine this type of retirement: they are living it. White Sands La Jolla is owned and managed by HumanGood, a nonprofit public benefit corporation serving older adults since 1949. It is not just the oceanfront location that makes our retirement community a one-of-a-kind destination; it is also the care we take to provide the best lifestyle possible. Whether you are seeking an intimate studio or an expansive two-bedroom apartment, we know you will find a floor plan that meets your requirements, such as having a full kitchen, an in-unit washer/dryer or a balcony with ocean views. From our on-site arts studio and fitness center to the boutiques and golf courses located in La Jolla, you won’t have to wonder how to fill your day. Whether you want to join a group outing or simply explore on your own, you have the freedom to create the day of your choosing - even if it means lounging under a shady umbrella reading a book! Our community dining room features superb meals that are prepared fresh every day by our talented chefs. You have the flexibility of opting for a meal plan if you want to continue cooking at home or choosing to leave the meal preparation to us. You also don’t have to worry about housekeeping or driving, as we take over those responsibilities for you. 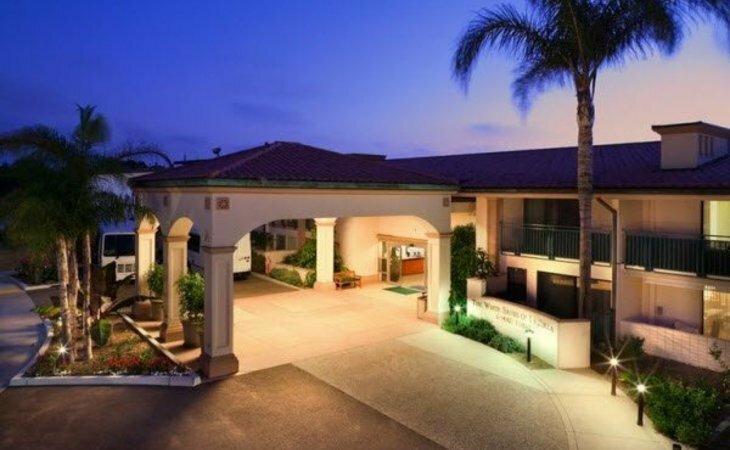 When you join White Sands La Jolla, you can rest assured knowing that your future health care needs will be met since our community can accommodate assisted living, skilled nursing and memory care. There is an on-site wellness center where you can meet with a nurse to discuss a health issue or receive a wellness checkup. We also provide a full range of programs and activities that will keep you mentally and physically active. When oceanfront retirement living beckons, White Sands La Jolla is the perfect destination to retire in style. What should caregivers and potential residents know about White Sands La Jolla?